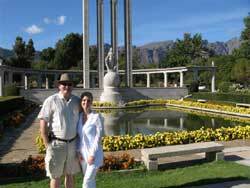 Mike and Robin Covington from Louisiana at the French Huguenot Memorial in Franschhoek Mike Beaudine (right) from Orlando, Florida, spent a day in the winelands and had a chat with Thys Lombard, Marketing Director of Tokara while enjoying the awardwinning Pinotage. I have had the good fortune to have lived in this country for more than 60 years, forty of which was in the winelands of the Western Cape. I lived through and welcomed the end of a political system and had the privilege of experiencing the Madiba Magic. So I had reason to believe that I have seen it all, gone through it all in this amazing country. Till this FIFA World Cup 2010 came along! Not Sepp Blatter in his wisdom, or Madiba, or who ever, could have foreseen what our nation is going through now. 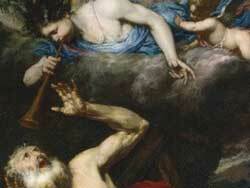 And this is just to show you that vuvuzelas have been annoying people since 1660. 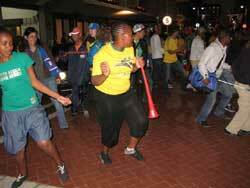 The vuvuzela has come to stay. All and sundry complain about the terrible noise, but complain with a smile. It thus became synonymous with the World Cup 2010 together with the dancing in the streets. We are experiencing a vibe that is impossible to describe in writing. Forget about all the wonderful stadiums that we are now sitting with, the new infrastructure that has been created, the millions that have been spent that we can't really afford, even the irritation of thousands of vuvuzelas. What has happened to us as a nation is priceless, and we have left a heritage that will change this country forever. The togetherness we have felt in the stadiums, the fun and smiles in the streets, the "discovery" of Soweto by a mostly Afrikaans speaking rugby(!) community just before this football madness- all this has contributed to this feeling of euphoria. We are indeed very fortunate. All I can add to that, come and see for yourself how a nation is being shaped. In the meantime life goes ahead, and most winemakers are either in Europe promoting their wines, or doing a bit of biltong hunting in the Karoo, i.e. shooting antelope to dry its meat to eat as the most popular delicacy in South Africa. And having been born and bred in this area, I must agree, it is getting prettier every year, and with luxury accommodation like Life & Leisure in the centre of historic Stellenbosch, you can't go wrong. What remains for us to do after the World Cup? 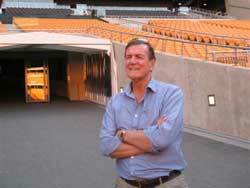 Pietman in the tunnel of Soccer City in Johannesburg where the final is to be played. 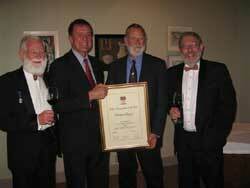 Pietman receiving his award as Wine Personality of the Year from the Institute of Cape Wine Masters; Dave Hughes, international writer, commentator and wellknown judge on various international wine shows, Pietman, Duimpie Bayly, Chairman of the Institute of Cape Wine Masters, and wellknown tasting panelist and commentator and MC, Bennie Howard CWM. The whales have arrived in Walker Bay for their normal winter performance. 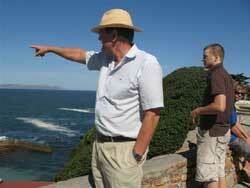 Pietman pointing towards a humpback who will possibly stay in the area till about November. There will certainly be problems. Some of them financial, some political, some structural, and some possibly even social. But you will find it hard to find a more exciting atmosphere and package. The world now knows that we can organise, that we can produce food, and make wine, and that the rumours of criminality are totally exaggerated. Let me take you on a wonderful trip down our towns' and winelands' memory lane of an event filled history, a rich culture and memorable legacy. 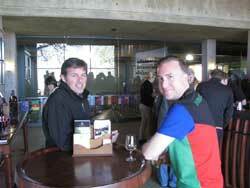 I have the background, the knowledge and the acumen after so many years in the wine and brandy industry. This year I had the special privilege of being named the Wine Personality of the Year by the Institute of Wine Masters for my contribution over more than 40 years to the trade, and also of being rewarded by the SA Wine Cellars, as a unit the biggest wine producer in South Africa, for the contribution I have made towards the industry. Although I am deeply touched by these awards, I am filled with gratitude for the opportunity the industry gave me to study its history and to enjoy the rich and varied culture that surrounds it. All these experiences have equipped me with the necessary skills and know-how to provide visitors with the information they need to make their visit to the Winelands an unforgettable one. Michael Fridjon, well-known international wine writer, writes in the April edition of Meininger's Wine Business International; "Stellenbosch enjoys iconic status in the world of South African wine. It is also home to many of the country's oldest and most admired estates." The retirement job that I chose for myself is to accompany visitors through this wonderful world of ours, and to boast about what our winemakers and estate owners have achieved. To say that I have been blown away at the hospitality South Africa has shown the rest of the world would be an understatement. I think back on recent Olympics and struggle to remember much reporting in the USA of athletes from other countries. I remember when a Togolese guy won a bronze medal in kayaking and NBC reported it and I thought to myself, "where are all the other fascinating stories like this one...like the Jamaican bobsledding team." In today's America, sadly, we have drifted so far towards being so US-centric that we only seem to root for the Americans. Not so here in South Africa. I've been here since early May and each week I have become more and more impressed with the global embrace that South Africans have offered up to the world. On the way to the airport a couple of weeks ago, I heard a radio program that said each day they would focus on one country that would be coming to South Africa for the World Cup, and they would explore not only that sport's history in soccer, but also their politics, religion, and socio-cultural practices. On the television, I've seen numerous programs that focus on a particular country and it's history of soccer and how the history of that country is intertwined with their soccer history. I've seen programs on India, exploring why India enjoys soccer but hasn't really excelled at the global level... yet. And I've seen shows on soccer in Muslim countries. Maybe it's planned, maybe it's unplanned, maybe it's by chance, but it is happening. It's not just about South Africans showing off their varied and multifaceted culture to their global guests, it's also about using this opportunity to educate South Africa on the rest of Planet Earth's inhabitants. As I moved through my work here in the provinces over the last six weeks, I had a pivotal meeting with the Board members of a rural NGO. They were explaining their guiding program philosophy of Ubuntu. No, not the Linux program. I'm talking about the traditional African philosophy of Ubuntu that essentially says, "No man is an island." To me, Ubuntu is the acceptance of others as parts of the sum total of each of us. And that is exactly what I have experienced during the lead up to, and the initial days of this World Cup. There is nary a South African citizen that I've met on the street, or in shops or restaurants or hotels, that hasn't gone out of their way to greet me and make me feel like I am home. And I don't mean that in the trivial, "Oh, aren't they nice, homey people here... " sort of way. I mean real, genuine interest and questions. People seriously want to know where I come from. What it's like where I live. How does it compare to where I am now. What do I think of South Africa. Oh yes, and what do I think of Bafana Bafana... The questions and conversations are in earnest. They are honest. And they are had with enthusiasm and a thirst to know more. South Africans are drinking deeply from the cup of humanity that has been brought to their doorstep. I would never imagine that an American World Cup or Olympics would ever be this welcoming to the rest of the world. And that saddens me for the state of my home country, but it also makes me feel the pride of the South African people. I have been truly humbled on this trip. And while I have my gripes regarding development here, I cannot say one negative thing about how South Africa has handled its duties as host and hostess to the world. If I could say one thing to sum up being here during this once-in-a-lifetime experience, it would be that I've learned the value of Ubuntu, and that when found and offered in abundance, the world is indeed a better place to live in. So, if South Africa accomplishes nothing more on the playing field, it will still have won as a host country. I am a cynic, no doubt about that. And yet I have to admit, I'm a little teary just writing this because I leave for home next weekend and I will be leaving a little piece of myself here in South Africa. I just hope I have learned enough to bring back a little piece of Ubuntu to my homeland, where perhaps with a little caring and a little water, it will take root as naturally as it does here, in the cradle of civilization. It's funny, many people in America still ask me, "are the people in Africa very primitive?" Yes, I know, amazing someone could ask that but they do. And when they do, I usually explain that living in a mud hut does not make one primitive, however, allowing kids to sell drugs to other kids and engage in drive-by killings -- isn't that primitive behavior? I think it is. When I think of Ubuntu and my recent experiences here, I think America has much to learn from Africa in general, in terms of living as a larger village; and as human beings who are all interconnected with each other, each of us having an affect on our brothers and sisters. As the 2010 Cup slogan goes, "Feel it. It is here." Well, I have felt it, because I am here. Thank you South Africa, for giving me this unexpected gift. I am humbled. "There are known knowns. These are the things we know that we know. There are known unknowns. That is to say, there are things that we know we don’t know. But these are also unknown unknowns. There are things we don’t know we don’t know." Being ignorant when it comes to the unknown unknowns is understandable, but what constantly amazes, in respect of our continent and our country, is how little many people know of what are or should be, the known knowns. Non-Africans, and I suspect even some South Africans, often fail to grasp that Africa is not a country, but a continent. And a very large continent at that; the land mass of Africa is larger than the combined land mass of China, India, the US and Europe. This vast continent with its more than 800 million people is made up of 53 diverse countries whose inhabitants speak more than 2000 languages. And to mention only a second aspect of Africa’s diversity, per capita GDP in 2009 for example was 51 times higher in Equatorial Guinea than in the Democratic Republic of Congo. Another common mis-apprehension is that South Africa is a non-African country meaning unsuccessful. How does one define a successful country? Would you agree that a country with the following score-card can rightly be defined as successful. Let us call the country X.
X has the world’s 26th largest population and 29th largest economy. X’s currency is the 2nd best performing emerging market currency of the 26 monitored by Bloomberg. The IMF’s World Economic Outlook ranks X in the top 10% of countries in respect of real GDP growth projections for 2010. X was ranked as the 18th most attractive destination for foreign direct investment by Global Strategic Management Consulting Firm AT Kearney. In the Economist Intelligence Unit’s Survey of Democratic Freedom, X ranks 31st of 184 countries. X has sold $1.8bn worth of cars to the US last year, putting it ahead of Sweden and Italy as supplier to the US auto market. X, according to the Open Budget Index, ranks 2nd worldwide in terms of the transparency surrounding its budgets, just behind the UK, it ties with France, and is ahead of New Zealand and the US. X is ranked 30th out of 178 countries for ease of doing business ahead of Spain, Brazil and India according to a joint publication of the World Bank and the International Finance Corporation. X’s media ranks 26th out of 167 countries in the Worldwide Press Freedom Index 2007, higher than any country in Asia, the Middle East or South America, and ahead of Spain, Italy and the US. Tax revenue in X has increased by 220%, over the past 10 years. By now, I am sure, most of you have guessed that the mystery country of course is South Africa. Or rather South Africa as we have just analysed it, by focusing on the positive aspects. Of course there is another side to the coin. Our unacceptably high levels of crime and low level of policing efficiency. Our inability to achieve the desired output for our vast expenditure on education bearing in mind that – 25% of our non-interest budget expenditure goes to education. Also the ever present fear of corruption and maladministration, etc., etc. I am sure everyone has his or her own little list. I would submit, however, that the positive aspects, that I have briefly referred to (and there are many more) at least prove that contrary to the way pessimists perceive South Africa there are definitely two sides to the South African coin. The challenge for every South African appears to be which side of the coin do you wish to focus on for example when you drive to Cape Town International Airport - which is the lasting impression on your mind - the unsightly (albeit diminishing) shack lands – or the glittering new Airport precinct. Cape Town International Airport is regularly judged to be one of the best (mid size) airports in the world. But as pointed out earlier, South Africa is unquestionably part of Africa. So we should also look at Africa.Firstly, how is Africa faring politically. Fortunately we now have a very handy yardstick with which to measure African Governance. That is the Mo Ibraham Index established by the like-named Sudanese billionaire and compiled by a team from The Harvard Kennedy School of Government. The criteria used to compile the index are: economic stability, corruption, security, rights, loans, elections, infrastructure, poverty and health. The 2008 Mo Ibrahim Index stated that 31 of 48 sub-Saharan nations recorded higher scores than in the previous year’s survey. What this index reflects is the reality - that in Africa today the political generation of the Bwana Mkubas (Big Men) is showing signs of passing – prompting some to speak of Africa’s Second Liberation. Those with a clear understanding of modern Africa believe that it is the growing democratization of Africa that allows the warm water of the market to spread within its states – a trend that in turn reinforces the spread of greater democracy. Economic and Political freedom will continue to lead as it has already done, to economic opportunities, social upliftment and a new place for Africa on the World Stage. One powerful reason for this welcome change is demographic. The post 1960’s African population boom means that the continent’s electorate is on average young. Never having lived under colonialism they are far more likely to hold their politicians responsible for the challenges facing their countries. Blaming colonialism is increasingly seen for what it is, namely an excuse for bad governance. Another reason for the greater democratization is the bigger role played by women in African politics. In Ellen Johnson Sirleaf of Liberia the continent has at last elected its first female president, one with an open style and a technocratic bias. Previously chauvinist parliaments across the continent are seeing the number of women MP’s increasing. In Rwanda, a recent African success story, the ratio is now 56%. In South Africa it is 33% with females constituting 40% of our Cabinet. Further support for the Second Liberation has come from Africa’s increasingly vociferous fourth estate. In an ever growing list of countries the Media has become the guard dog that barks and that no longer readily responds to being told to shut up. The justice system in a given African country may not yet always be able to bring its former leaders to book. However Frederic Chiluba in Zambia and Bakili Muluzi in Malawi are welcome exceptions. In addition, external institutions, supported by African Nations are being established to fulfill this role. Charles Taylor of Liberia is having his day in court in The Hague and the International Criminal Court has even issued an arrest warrant for the sitting President of Sudan, Omar Bashir. Just as Africa’s condition and future development will have a massive impact on South Africa, so will developments worldwide impact on Africa. So what will the New World look like that South Africa will likely inhabit in 2020? China with a population of 1.5bn by then will be close to overtaking the US as the world’s largest economy. India (2020 population of 1.3 bn) will be a top 5 economy and Indonesia will be emerging as an Asian Brazil, resource-rich and with a population of 275 million. Commodity-rich countries from the “New World” – Africa, the Middle East, Russia, Indonesia, and South America will be prospering, because of Asian demand for their products. Most of the “Old World” – the US, Europe and Japan plus their adjacent, dependant regions such as Mexico and Eastern Europe will be stuck in a low growth economic rut. Indeed the coming decade may well be the West’s Japanese-style “lost decade”. The reason being that the demographic consequences of the ageing of the Old World – coupled to the fact that the US, UK & Europe – 15% of the world’s population – currently consume 70% of the world’s mobile savings - this means that in the West there will be higher interest rates, a higher cost of capital and consequently lower economic growth. Overall South Africa will live in a more globalised, intensively competitive world economy that will be increasingly focused on an urbanizing, industrialising Asia. The region which by 2020 will also dominate the growth in global consumption, driven especially by the exploding middle classes of China and India. By 2020 it is projected that South Africa will have a population in excess of 53 million of which 30 million will be under the age of 25. Forced by intensive competition from Asia on South Africa’s remaining industrial base our economy will have to refocus on its core, defensible, competitive advantages : mining, agriculture and tourism. Sectors that are doubly blessed in that they are all labour-intensive and export orientated. South Africa’s trade focus will by then have diversified significantly from the West. Asia will have become by far our most important trading partner - China most obviously but with English-speaking India a strong number two. Indeed the Indian Ocean Basin – from South Africa in the West to Australia in the East will have become a very prosperous trading basin. South Africa’s economic status will be secured by its natural-resource based development with targeted value-added propositions added on to this foundation further enhanced by the development of tourism - a “magic” industry in that it is an export-earning service sector capable of absorbing large numbers of lower skilled workers - especially in rural areas. But then to optimise these opportunities we South Africans will have to learn to think out of the box socially, politically and economically - designing policies that are made for South Africa and that are good for South Africa. Events over the last two years have illustrated that the capitalist way is not only to be found in the West. We must and I believe we will develop a 2020 vision for South Africa that is much more globally relevant than to-day in the Asia-centred, commodity-hungry world we will live in by 2020. Sceptics of course will have grave reservations as to our ability to develop and implement such a vision. The answer to such sceptics (perhaps the same people who were hoarding bully-beef and candles in the run-up to the 1994 election) is to point to the many successes we have achieved as a country - in 1994 and in the sixteen years since. As Roelf Meyer recently wrote in Die Burger. In taking stock we should compare ourselves with comparable countries in the rest of the world. We should not compare ourselves to the developed or Western World, because we were never part of that world. We should compare ourselves with developing countries and also countries that recently emerged from internal conflict. In the latter group we are a shining star and within the international community South Africa is still hailed as a beacon of successful conflict resolution. Roelf refers to a 2009 issue of the Economist in which comparisons are drawn between 180 countries and specifically the 65 best economies in the world. According to the survey: South Africa has the 25th largest purchasing power, is the 39th largest exporter, is the 25th largest manufacturer of goods and the 28th largest supplier of services. On the competitiveness Index we rank no 45. Not great, but it looks a lot better when one notes that Brazil, considered one of the leaders of the developing world and with a much larger population ranks 43. But these are the achievements of yesterday and today. And we have to get from 2010 to the 2020 Vision. Other countries or societies will not do it for us. The Government on its own cannot do it. "No policy – no matter how ingenious - has any chance of succeeding if it is born in the minds of a few and carried in the hearts of none" and Ronald Regan said: "The most terrifying words in the English language are: I’m from the Government and I am here to help". "Make a positive difference, no matter how small, inter alia, by developing a positive mind set : Perhaps along the lines of what George Bernard Shaw said "You see thing and you say "WHY?, but I dream things that never were and I say "WHY NOT?" Do not be overwhelmed by all that is still unacceptable or sub-standard. Look around at the great things that are happening - Soccer World Cup. We should not only see the positive - but embrace it and contribute to it. Surely then, but only then will exponential benefits flow to all of us who share this beautiful country.